Another year has come and gone and, like most, I’m looking back and thinking about everything that’s happened over the last 12 months. 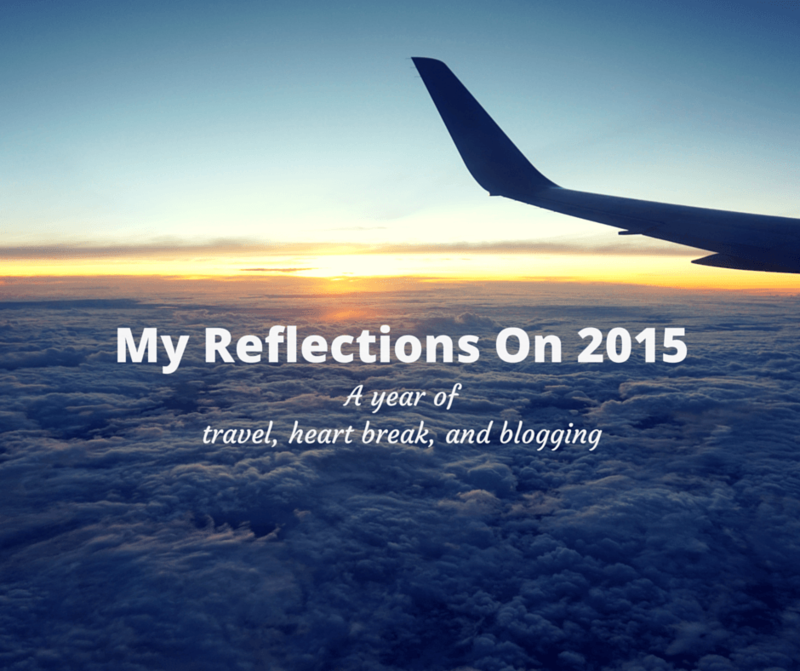 I went back and read my reflections on 2014 and I realized that I definitely fulfilled one of the goals I had set for myself, which was to make travel a priority. It’s no secret that I love to travel, but this past year I managed to squeeze in more trips than I ever have. Even with working a full time job and being in school for my MBA for 7 months out of the year, I traveled to: New York City, Phoenix, Boston, Ecuador, Peru, Puerto Rico, Thailand, Cambodia, and Charleston. I also visited a lot of new places in my home state of Florida. It was crazy and sometimes stressful to travel so much considering I had so many other responsibilities, but I loved every second of it! Of course, money was always tight. People at work still don’t understand how I do it. But I always tell them the way I afford to travel is by not spending money on stuff I don’t need and prioritizing what’s important to me. It’s hard to say what my favorite travel experience of 2015 was. However, I think if I had to narrow it down, it would be finally visiting New York City for the first time, exploring Machu Picchu, learning about elephants in Thailand, and walking around Angkor Wat. If you’ve been following my blog for a while, you’ll remember that I often traveled with my boyfriend Will. Back in September, however, we broke up. I won’t go into detail, for obvious reasons, but I will say that I took it pretty hard. As far as my blog goes, he had been a part of it from the very beginning. He was my first follower on Instagram. He would proofread my posts. He’d hold up Buddy for me so I could take pictures. But most importantly, he was always so encouraging. For this reason, I decided not to alter any of my old posts. I had considered going back and changing them to say “my ex-boyfriend…” or even deleting him from the posts altogether. But I don’t think that would be right, considering how much he helped me with the blog. And as hard as it was to realize that he would no longer be a part of the BTTM team, I have to believe that everything happens for a reason. What a year it’s been for my blog! I was still floundering with it for a bit in the beginning of the year. I wasn’t writing as much as I wanted to because of work and school. I kept comparing myself to other bloggers and thinking how horrible I was. I even wrote a post about how blogging was depressing AF. But eventually I got into a groove. I started writing pretty consistently and my followers were growing. I went to two blogging conferences, WITS and TBEX, where I learned more about my craft and met some amazing people. The only hiccup I had was after the breakup. I didn’t write anything for a while and I barely touched my social media accounts. Naturally my motivation was low and my numbers dropped. But I’ve gotten back in the swing of things and I’m getting back to writing consistently. I’ve recently hit the milestones of having over 2,000 followers on both Instagram and Twitter. And, I had my first comped stay at a resort in Thailand and had a comped tour in the Everglades. All things I thought would never happen. I honestly have no idea. I don’t have any trips planned for 2016 yet. I’m not sure whether I should stick to smaller trips throughout the US so I can travel more frequently, or save up and go on a bigger trip out of the country. I’ve also been considering teaching English in another country. So I dunno. As of right now, I’m just gonna wing it and see how things go. The only thing I do know is that I’m going to continue to blog about my adventures and hopefully it will inspire others to travel and go on adventures themselves. Lovely post! We think you had an interesting and awesome 2015. Happy New Year! Reading your reflections just gave me a huge boost of inspiration and motivation. Its pretty incredible to really grasp how much travel that you’ve managed to squeeze in, all while holding a full-time job. I think you’ve actually gone on a lot more adventures than many other so-called nomadic bloggers I follow. As I make a transition from full-time travel to possibly working full-time again, you give me heaps of hope that travel can still be a priority. And as someone who’s been struggling to keep up with his own blog lately, I can totally relate. But if you can manage to maintain & grow this awesome blog amongst a full-time job, a breakup, and school, then I seriously have no excuse, lol. I’m now motivated to try and start rocking things again. Cheers to you and Buddy! Happy travels and New Year! Thanks for including Backroad Planet in your annual review, Vicky! I am so envious of your travels in South America and Southeast Asia. I think my favorite part of this post is your decision to not remove Will from your archive. Even negative events in our journeys play their role in shaping us as the people we are today and often open the door for amazing opportunities. In our case, it was a post from a lost contest that led Viking Cruises to us with an offer for our first sponsored trip. Here’s to an amazing 2016 for you and Buddy! Hopefully 2016 brings a new job for me. I hadn’t realized you and Will broke up that long ago. I’m glad you were able to power through and get back to work/traveling. I’m sure 2016 is going to be great for you. Best of luck! Great year end post! Thanks for sharing! I’m sorry to hear about the break-up challenge but glad to hear you didn’t hit the ‘delete’ button. The person you are today is because of all you were then and everything you went through. Happy New Year and Cheers to an awesome 2016 for you and Buddy!! You are definitely in your groove Vicky and I’m thrilled that you are back in the game. If you ever need someone to hold up Buddy in photos come August, you’ll find me in Scotland. Congratulations on your social media milestones, I am going through a bit of blogger burn out just now, looking forward to travelling again come January with fresh stories to share. Here is to you, all the best for 2016 girl! Thanks so much sweetie! I hope we are able to meet up one day and take that epic selfie we’ve always talked about 😉 Have a Happy New Year! Thanks love! I really appreciate your kind words and friendship. I hope you have a Happy New Year sweetie. Safe travels! I’m glad you got to travel so much, but sorry about the personal issues. I hope this year goes even better for you, with travel, fun, new friends and adventures. PS We’d also like to go to New York. I haven’t been for 20 years! Awww big hugs regarding the breakup. That must be tough! Hope 2016 will be better for you in that sense. Wishing you more adventures this upcoming year. You know it was a good year when travelling was the priority! Sad to hear about your break-up, Vicky, but it seems you’ve got it all sorted in your head now and the hardest part is behind you. Good luck in 2016 and many more adventures to come! It’s so cool and nice the way you deal and write about even very personal and private issues. I understand several aspects of your reflections… mainly the one about keeping on writing and traveling without an important travel mate. I think life is like a ever traveling train; we embark travel mates to share a part of the way with, and then we must let them go. Have a very happy and funny (and crazily traveling) 2016! stay always so cool! Looks like you had a busy year! I also work full-time and know how hard is to squeeze travel in a busy schedule. I’m seriously considering Peru and Ecuador for 2016. Awww I love this. Thanks for your honesty. Well Vicky, I enjoyed meeting you not just once but twice this past year. Wishing you lots of adventure in 2016. Wow, Vicky, what a roller coaster year for you. I’m so glad to see you happy again and having new excitement for the New Year. You are such a superwoman, I don’t know how you can blog, have a full-time job, study for an MBA and travel so much! I look forward to all the success you will have in 2016! The moment I stopped comparing myself with other bloggers, I finally became happy about my achievement. There will always be others that will be better, larger and more online than you, but be proud of who you are and what you have achieved! All the best for 2016! Looks like a pretty great year overall! You did so much traveling while working full time and going to school–I always love seeing how people make it work–great job! Machu Picchu sounds like it was amazing–I would love to go there. Best wishes for an even better 2016! You had a great year, hope your 2016 will be more exciting. Would like to see lots of amazing photos.